This commercial duty, hot water propane powered pressure washer is a fully self contained cart mount power washing unit designed to deliver 4 gallons per minute at 2000 PSI. It is equipped with a 9 HP gasoline driven with low oil protection and electric key start engine. All equipment comes installed on a powder coated frame and includes the following specifications. This commercial duty, hot water propane powered pressure washer is a fully self contained cart mount power washing unit designed to deliver 4 gallons per minute at 3500 PSI. It is equipped with a 21 HP LP Driven Kohler engine. All equipment comes installed on a powder coated frame and includes the following specifications. This commercial duty, hot water propane powered pressure washer is a fully self contained cart mount power washing unit designed to deliver 5 gallons per minute at 5000 PSI. It is equipped with a 25 HP LP Driven Kohler engine. All equipment comes installed on a powder coated frame and includes the following specifications. BVE Series - BV gas-fired hot water pressure washers provide high performance with modular design. These machines are ideal for industrial and commercial cleaning applications. They are available in either NG or LP configuration to allow you to accommodate your individual needs. 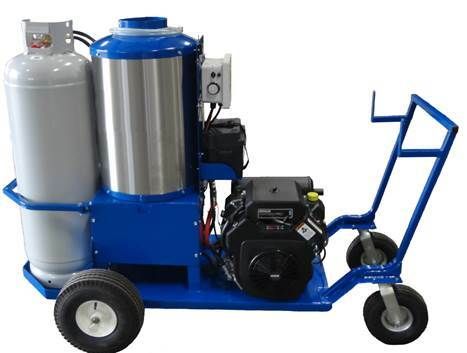 These power steam cleaners can deliver hot / steam temperature output to 250-300° F. Available Kranzle electric motor with diesel fired burner steam pressure washers and electric powered steam washers with natural gas or liquid propane burner.